This old photograph shows the two lighthouses on Devils Island. The lighthouse on the left is the lost Southwest Lighthouse of which only some foundation stones remain. 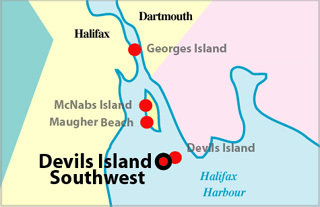 Devils Island is located at the entrance to Halifax Harbour south east of McNabs Island. This island was inhabited by fisher families and had two lighthouses. 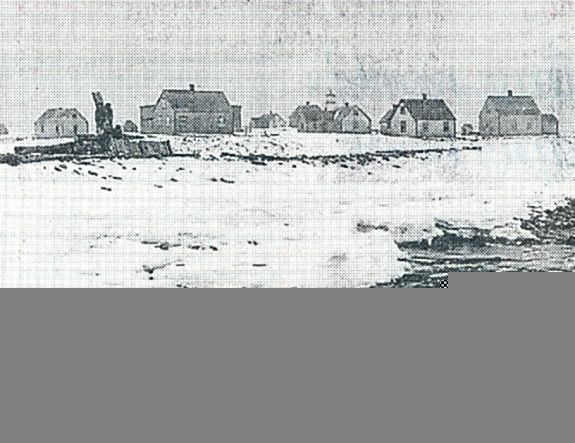 The South East Lighthouse is still standing and operating, but the South West Lighthouse was demolished and all that remains is part of the foundation. This photograph shows the houses which once stood on Devil's Island. They numbered as many as 40. The South East Lighthouse can be seen above the houses in the center.